Getting a 3D ultrasound is a fun way for expectant parents to meet their new baby before he or she is born. More couples than ever are requesting this state-of-the-art technology to obtain fantastic prenatal pictures to keep in scrapbooks and baby books. The pictures you receive from your 3D ultrasound will have great clarity and detail. For the best pictures, you will want to be at least 24 weeks into your pregnancy. The longer you wait, the more developed your child's features will be, giving you a better idea of what he will look like. Having an ultrasound around weeks 28 to 34 seems to give you the best chance for optimal pictures. Where Are 3D Ultrasounds Offered? 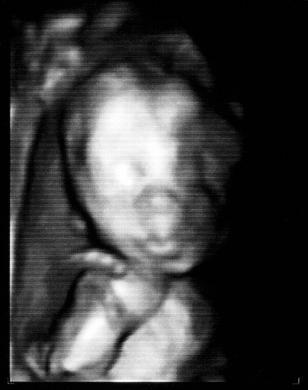 If you want to determine (or confirm) your baby's gender, the 3D pictures can help the sonographer make a more informed guess. However, keep in mind that the baby may not cooperate or he could be in a position that makes an accurate guess impossible. Some companies will give you print-outs of the best ultrasound pictures. Others may give you a CD of images, labeled with what you are seeing (leg, arm, head, boy/girl parts). You may be able to find a 3D/4D imaging center that can offer even more options for you to choose from. Some hospitals offer a 3D ultrasound. To find out if yours does, ask your physician. You may have to schedule two ultrasounds, because 3D ultrasounds are not often covered by insurance companies unless ordered by your doctor. To find a separate 3D imaging center, get recommendations from your doctor. Ask friends who have had them done. Even the yellow pages of your phone book may give you a few places to start. What are the qualifications of the sonographers? What do I get for my money? Just photos, a CD, or both? Is a video of movements included in my package? Centers who employ registered sonographers and who require notes from physicians are often a good bet for quality. The sonographer may help you determine gender, but will not (and should not) attempt to give you a due date or diagnose any problems. Places like Prenatal Peek have locations across the country and can help you get a sneak peek at your child's development and gender. Because most 3D ultrasounds are not physician-ordered, they are usually not covered by insurance companies. Although some doctors do use the images to make a few diagnostics, usually they are done solely for the benefit of the parents. Cost of the ultrasound will probably involve several factors. The qualifications of the sonographer, location of the center, and amount of photos you receive will all be figured into the total amount. Most 3D sessions seem to run between 200 and 400 dollars out of your pocket. Contact a center early in your pregnancy and save your money to pay cash. Go on a payment plan or separate billing system. Ultrasounds done at a hospital or clinic may allow the cost to be added to the total billing they send you. If someone wants to give you a special pregnancy gift and ask what you would like, tell them about the 3D images. Even if your insurance company does pay for regular ultrasounds, you will want to be sure and check on the 3D ultrasound policy before scheduling an appointment.